this piece was bought over from France right after WWII. About 6 foot tall with the base added to it. Beautiful, Rebecca at the well about a little later as these were made in Italy and around 1966 when they were making a lot of these for export. They were not making these right after the war Will add to my others I have detailed the large retail export business and so many businesses were set up at that time to sell these treasures. 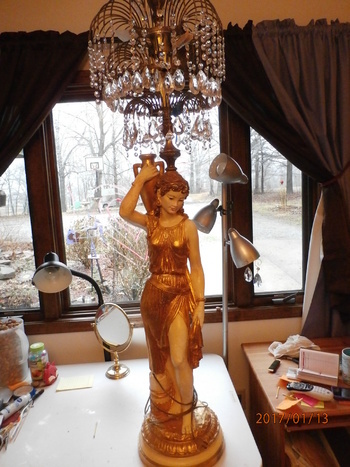 Some of the bigger ones were made of plaster, good quality usually, and some statue lamps they made in metal. Most were made in plaster. Thanks Mike, Wow, so you say marked : the markings on it say Art Continental Co. 1947 and this piece is made of plaster. it is 5'6" tall with the base. I know well of the work of Continental and their impressed markings. They were normally in the league of Reglor which produced the market first. First you probably are correct, though not of their work style of 1947. Reglor was the biggest name and often sued others for infringment, though they never won big. The lamps look like California style which were also the biggest rival of the Italian export trade in the late 60's to early 70's. I am more confused now than ever !! This is gorgeous! And I have to say, it sure feels good to know I am not alone in feeling confused!!! (I was going to say that in a post today, decided to delete it)! Ok. now I see that Continental made these also and the date that I gave you of around 1966 is just one year off as 1967 yours actually is dated, as I felt that 1947 was wrong. As that date coincides exactly with this time of many export shops opening to sell such items. I think now your mystery is solved. Keep this post up as it is an important one. This really is great, the statue is stunning ! I love Continental's work ! Doowoopp66, I think you can mark it as mystery solved!!! A friend of mine has 2 of these lamps and also was wondering what is the value? He also has a Cherub lamp that has the same chandelier and have not been able to find one on the web. Any help would be great. He also has a 1920 King Louis French writing desk that I cannot find the value on.